Top from left: Richard Cassady, Ethel Goodstein-Murphree and Kevin Hall; below: Daniel Levine, DeDe Long and Gary Peters. FAYETTEVILLE, Ark. — The Honors College will recognize five faculty and one staff member at the annual Honors College Faculty Reception on Tuesday, Nov. 6. The awards are in two categories, the Distinguished Faculty Award and the Distinguished Leadership Award. 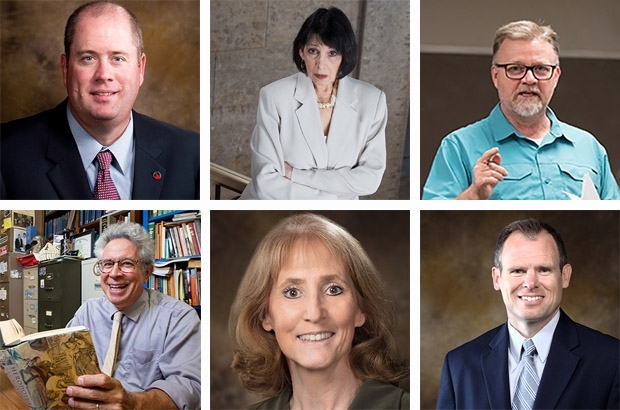 The recipients of both the Distinguished Faculty Award and the Distinguished Leadership Award will be presented with a bronze medallion designed by honors alumnus Hank Kaminsky. Each winner also will receive $1,000 in academic funding. Kevin Hall, the Walter E. Hicks and Blossom Russell Hicks Professor for Infrastructure Engineering in the College of Engineering’s Department of Civil Engineering. Hall currently serves as academic advisor to 29 honors students in civil engineering, and thesis mentor to four honors students. In addition to these mentorship credits, he is also a First-Year Engineering Program faculty mentor to one research team, and in summer 2018 he led a summer course introducing incoming Honors College Path freshmen to research in STEM fields. Hall has taught three faculty-led study abroad programs to Italy, in 2014, 2015 and 2017, which have included 16 honors students. Daniel Levine, professor of world languages, literatures and cultures in the J. William Fulbright College of Arts and Sciences. Levine has served on the Fulbright College Honors Council, directed numerous classical studies honors theses and served on many non-classics honors thesis committees. For the past 10 years, he has been part of the teaching team for the freshman Honors Humanities Program (H2P1) course. In addition, he has interviewed honors students as a member of the Honors Fellowship Selection Committee five times. He has taught honors courses in classical studies for more than 35 years, both on campus and on the 11 “Classics in Greece” study abroad programs that he has directed for the University of Arkansas. He will co-lead an Honors Passport study abroad program to Sicily in January 2019. He was a founding member of the University of Arkansas Teaching Academy and served three years as co-director of the University of Arkansas Teaching and Faculty Support Center. Levine has won numerous awards at the U of A for excellence in teaching, including the Master Teacher Award from Fulbright College (1995), the Excellence in the Teaching of the Classics award from the Society for Classical Studies, the Outstanding Teaching Award from the U of A chapter of the Mortar Board Senior Honor Society (1991) and the Burlington Northern Foundation Award for Teaching Excellence (1986), the highest teaching honor awarded to U of A faculty. Gary F. Peters, chair of the Department of Accounting in the Sam M. Walton College of Business and S. Robson Walton Endowed Professor of Accounting. Peters served as the director of the Master of Accountancy Program from 2006-2016. His current teaching credits include a Walton College accounting colloquium focused on ethics and corporate governance within the accounting profession. In addition, Peters facilitates accounting internship credit for Walton honors students. The internships specifically target intensive and transformative experiences for students. Peters was previously involved with the China Study Abroad Colloquium. Peters has previously received the 2016 Outstanding All-Around Faculty Member Award from Walton College. C. Richard Cassady, professor in the Department of Industrial Engineering and director of the First-Year Engineering Program. For several years, Cassady served as the industrial engineering representative on the College of Engineering Honors Council, and for two years he has served as director of the College of Engineering Honors Program. His most notable contributions to the Honors College are the creation and coordination of the First-Year Engineering Honors Research Experience, which has given more than 600 freshmen valuable research and presentation experience over its 11-year history. Cassady also was a principal player in the establishment of the First-Year Engineering Program and has served as its director since its creation. The program was intended to address concerns about the retention and graduation rates associated with first-year engineering students, and during his time as director of the program, retention and graduation rates within the College of Engineering have increased by about 10 percent. Cassady has previously received the 2016 Albert G. Holzman Distinguished Educator Award, the top teaching award given by the Institute of Industrial and Systems Engineers; the 2006 Charles and Nadine Baum Faculty Teaching Award; and the 2005 Imhoff Outstanding Teacher Award from the College of Engineering. He is an elected member of the University of Arkansas Teaching Academy. He is a fellow of the Institute of Industrial and Systems Engineering, a fellow of the Society of Reliability Engineers, and a member of the Virginia Tech Industrial and Systems Engineering Advisory Board. His community service includes robotics education in the Springdale School District and leadership in FIRST LEGO League Arkansas. He is tournament director for the FIRST LEGO League Razorback Invitational, a 72-team, international event held on the University of Arkansas campus. He is also co-founder and coach of Root Negative One, a FIRST Tech Challenge team affiliated with the Don Tyson School of Innovation in Springdale. Root Negative One was one of four finalists for the 2017-18 FIRST Tech Challenge World Championship. For his community and professional service, he received the 2017 Dean’s Award of Excellence, Outstanding Public Service Award. Ethel Goodstein-Murphree, professor of architecture and associate dean of the Fay Jones School of Architecture and Design. Goodstein was part of the inaugural team to launch the Honors Humanities Project (H2P), which was honored with the AIA/ACSA Education Honors Award in 1996. She has taught both H2P I and H2P II, and could always be found wearing royal purple during the Byzantium unit. In the Fay Jones School, Goodstein teaches an honors section of History of Architecture III: The Twentieth Century, and has offered honors sections of many upper-level electives, most recently Civil Rights/Civil Space with Dean Peter MacKeith. In the spring 2019 semester, she will teach a course titled Mid-Century Modern: The Designer’s Guide to the Postwar Era. Goodstein has been involved with about 40 honors theses, 20 of which she directed or co-directed, and has served on the thesis committees for both architecture and landscape architecture majors, as well as several Fulbright students. She has mentored both SURF grant winners and Honors College Research Award recipients, and the students for whom she served as thesis director have gone on to earn higher degrees in a variety of fields, including history, law, divinity and architecture. Other students have pursued careers ranging from architectural design to historic preservation to craft brewing. As a faculty member, Goodstein helped lead the drafting of the Department of Architecture honors curriculum, in concert with the founding of the Honors College, and helped facilitate the creation of an all-school honors curriculum with Dean MacKeith. She also created the curriculum for the first thesis-preparation course for the Department of Architecture. She serves as ex officio member of the Fay Jones School Honors Committee. As associate dean Goodstein has the good fortune of being a steward and supporter of the efforts of her peers in their work to advance the honors program and to cultivate the school’s most outstanding honors students. DeDe Long, director of the Office of Study Abroad and International Exchange. Long was the University of Arkansas’ first international admissions officer and has been in service to international education at the university for more than 35 years. In 2017 the U of A’s study abroad program was ranked fourth in the nation, according to Great Value Colleges. The university has seen its student participation in study abroad more than double since 2002, thanks in large part to the $300 million gift from the Walton Family Charitable Support Foundation, which established the Honors College and funded a generous endowment to support honors research and international studies. Long has been instrumental in managing this vast increase in study abroad. She also helped to expand the available international programs on offer to include internships, service learning, faculty-led programs, research programs and exchange programs, among others. She has helped send more than 12,000 students abroad during her time at the university. Long’s list of achievements includes positions as vice president for Phi Beta Delta Honors Society for International Scholars, member of the Board of Directors and vice president for public policy and practice for NAFSA: Association of International Educators, member of the Board of Directors for the University Studies Abroad Consortium, and member of the Board of Directors for the Fulbright Association. She chaired the 2015 NAFSA annual conference in Boston, and serves as the University of Arkansas campus adviser for the Fulbright Program and the Boren Awards. Long has previously received the Advocate of the Year Award from NAFSA, as well as the Region III award for Outstanding Service to International Education, and was the very first recipient of the University of Arkansas’ Hoyt Purvis Award for Service to International Education. Long is known for welcoming international students to her home for barbecues, marshmallow roasts and other celebrations to introduce them to American culture and help them feel at home at the U of A. About the Honors College: The University of Arkansas Honors College was established in 2002 and unites the university’s top undergraduate students and professors in a learning environment characterized by discovery, creativity and service. Each year the Honors College awards up to 90 freshman fellowships that provide $72,000 over four years, and more than $1 million in undergraduate research and study abroad grants. The Honors College is nationally recognized for the high caliber of students it admits and graduates. Honors students enjoy small, in-depth classes, and programs are offered in all disciplines, tailored to students’ academic interests, with interdisciplinary collaborations encouraged. One hundred percent of Honors College graduates have engaged in mentored research.